We had a great time meeting everybody at NAHBS 2015, and we learned so much. Even got to ride snow-covered trails at Cherokee Park and underground trails at the Louisville Mega Cavern. It can be further observed in FIG. 2 that the troughs 517 on opposite axial sides of the hump 514 effectively form two channels. When a tire is initially mounted on the rim, each of the tire beads will sit in a respective trough region 517. 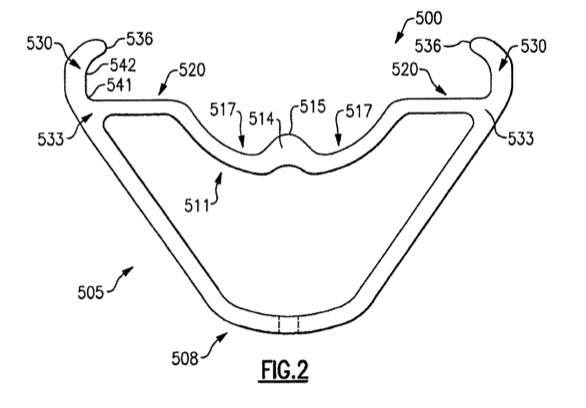 Not only do the hump and troughs serve to keep the tire beads separated and confined prior to and during inflation, the separate channels created by the troughs make it easier to trap air and thus easier to inflate the tire particularly in the case of manual pumping. The hump and troughs also keep the tire spread apart and allow for the valve stem (not shown) to inject the air directly into the center of the tire, easing the inflation process. Note that the hump is only in dependent claims 5-8, i.e., the hump doesn’t make it into the independent claims. 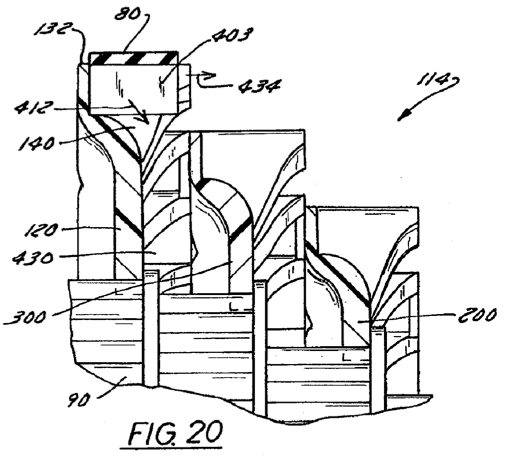 Related Patents/Applications: Continuation of US 12/420,595 (Issued as US 8,007,053), which is a Continuation of US 12/197,901 (Abandoned), which is a Continuation of US 11/965, 153 (Abandoned), which is a Continuation of US 10/959,743 (Issued as US 7,334,846). Conventional wisdom in the belt drive arena tells us that belt drive is only for single speed setups, and an internally geared hub or a gearbox is needed to change gear ratios. Not so according to Trek. 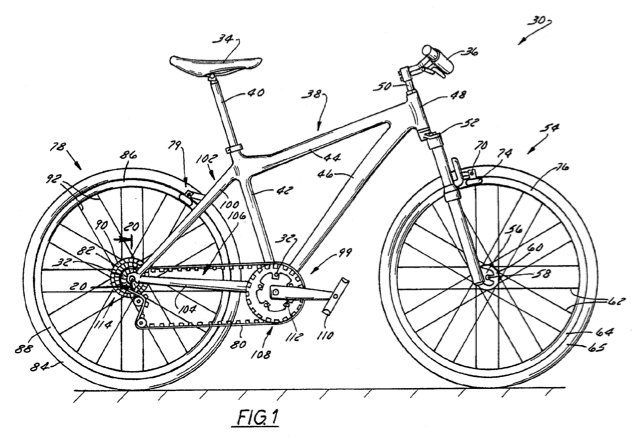 Trek is pursing a US patent application that shows a hardtail mountain bike with both belt drive and a rear derailleur. 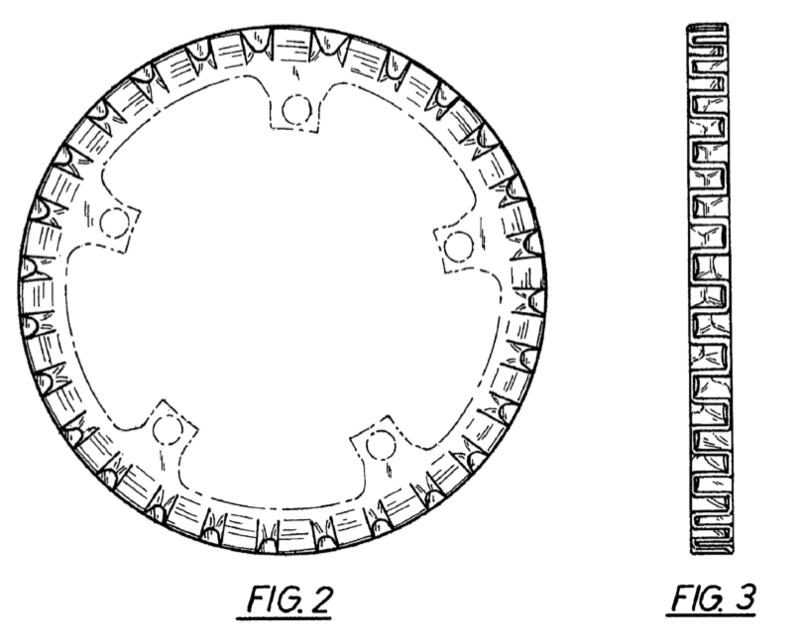 In March of 2012, Trek was issued a US design patent drawn to the chainring for this implementation. In other words, Trek envisions belt-driven bikes to have both front and rear derailleurs. 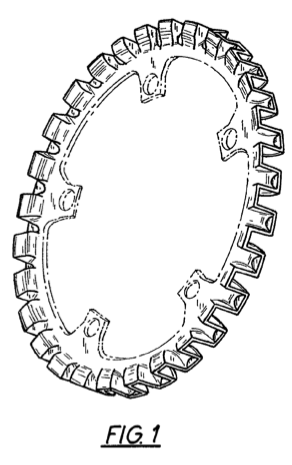 In the cross-section of the cassette, you can see that the belt 80 is engaged in the largest cog and moveable to the right as indicated by arrow 434. Looks like belt drive may be finding more applications soon.